Every New Year, millions of people vow to be better, do good, get rid of bad habits or get fit. But by the fifth week, 75 per cent of those people go back to their old ways. The early January swarm at your gym may be diminishing already, but you can still easily work towards the goals you’ve set for yourself — whether they involve fat loss, clean eating, doing 50 squats or just walking more. It’s all within your reach; no sweat! Alright, maybe some sweat. Commitment simply refers to the act of staying dedicated to something you have vowed to do, even after the moment you took the vow in has passed. This is precisely the concept that a relationship or marriage is built on. So why not look at fitness in the same vein, and make an oath to better our health? Ask yourself exactly what you want to achieve and why. Successfully staying fit doesn’t entail working out or eating right only when you are in the mood! The ‘why’ will get you through the toughest days. The answer could be anything from being able to fit into a gorgeous dress, to stabilising your blood pressure or getting in shape for a beach holiday. Making the commitment to achieve your fitness goals means never settling for anything less than what makes you feel strong, active, in the pink of health and comfortable in your own skin. Figure out the route you will take to achieve your goals. 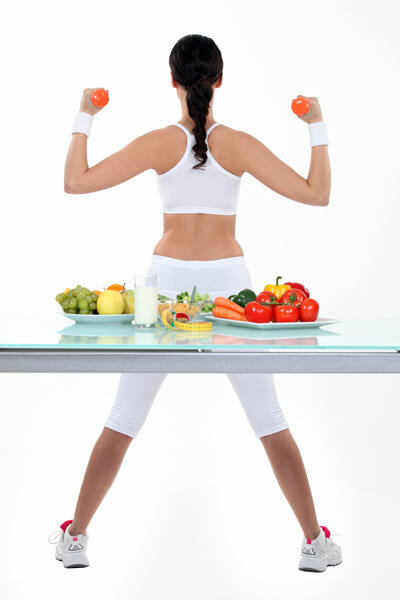 Consult a nutritionist if you want to change your eating habits and figure out the right plan for your body. If you want to work out, decide on a few different workouts that appeal to you and that you can stick to. If you hate yoga or pilates, that’s fine. It may be yoga for someone, but you can pick your elixir: running, swimming or a form of martial art. Choose the right path for your own personality and give yourself a couple of options to choose from when you want to switch things up a bit. You don’t always need a lot of time in order to have an effectual workout. So, on a busy day or low-energy day, remind yourself that something is better than nothing. Even while you’re at work, quick exercises done a few times at regular intervals can, honestly, work wonders. The break-room, pantry or even a spacious washroom can easily host you for five minutes of push-ups, squats or jumping jacks, or you can dedicate just 15 minutes to bodyweight exercises when you wake up in the morning or get home. A dedicated ex-colleague did a marathon round of abs, a few months after her daughter’s birth, while catching up on her favourite sitcoms! Just like getting married, making the decision to get fit is something you should share with everyone that you surround yourself with. Being held accountable for your actions will help you refocus when your own personal will plays truant. You don’t have to be alone on your self-improvement journey, and a bit of company and support along the way will push you harder. Who knows, you might even inspire someone to join you! Within the bigger picture or goal that you’re working towards, create smaller goals for yourself to achieve on a daily or weekly basis. Set a goal to drink six glasses of water each day…and when that starts becoming second nature to you, bump it up to eight glasses. Similarly, aim to stop using the elevator for two days each week and change and update those goals as you progress. Would you do any less with your work milestones? There will be days when you wake up feeling fed up. You will wonder why you bother, and most times, like we mentioned earlier, the answer to that question will help you to keep fighting. But, sometimes, it won’t be enough. You won’t want to do a single sit-up or look at another ‘healthy’ plate of food for the rest of your life…you will want to eat dessert or to just laze around — remember that it’s okay to feel that way. Before you completely reach your breaking point and eat a whole box of cupcakes, enjoy a little treat and take a day to recover, centre yourself and get back on track. Think realistically and don’t ever fool yourself into believing that it’s going to be easy. You will struggle — that’s a given — but when you do, remember that you’re human. Also, don’t punish or torture yourself just because you think that someone else is doing better than you. You have your own path, one that is exclusive to your lifestyle, personality, weaknesses and strengths. Focus on your own unique journey. If you need a goal, here’s our 10 day to great legs challenge. You may just surprise yourself!